ARE THERE ITALIAN CHEMICAL WEAPONS AND ABANDONED MILITARY DEPOTS IN THE TERRITORY OF TRIESTE? 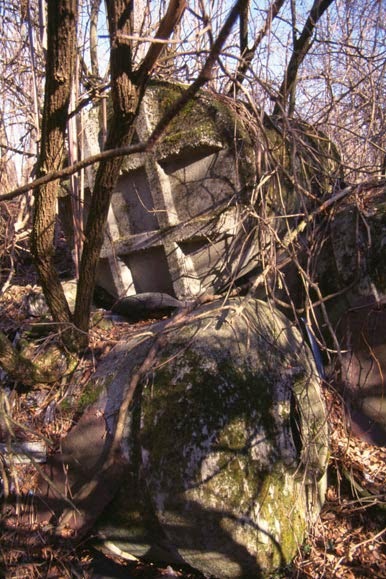 About one year ago [in 2011], we denounced to public opinion the existence of a network of abandoned military depots on the hills of Montedoro between the Municipalities of Dolina and Muggia. 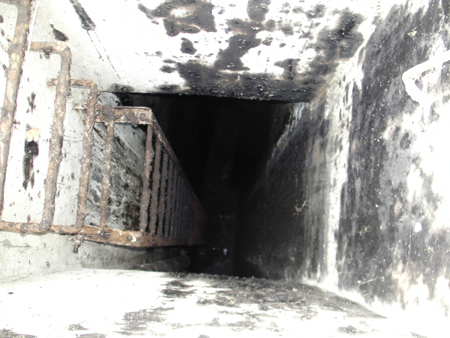 This structure is built completely under the ground; a fortified citadel with at least 14 armored depots at different depths (the illustration above is the entrance of one of the bunkers). From the ground, among the dense vegetation, several “periscopes” arise: it is the former blowholes. The remains of oil that are still on the floor and at the entrance of the cisterns, like the strong-smelling hydrocarbon vapors in the area are a clear sign that this is a big fuel depot destined to the armed forced that were here during the Second World War. For decades, the whole hill was a military area, therefore, civil administrators were prevented from controlling it. To this day, it remains unclear if the area – still fenced – was returned to the demanial property of local administrations or it remains – improperly – a military state property. All that is certain is, no one bothered to decontaminate the lands or to inert the cisterns, which keep spreading pollution, slowly contaminating the surrendering environment. Also, buried alongside the depots, there are the pipes of the municipal aqueduct. How comes that nobody ever worried about the danger all of this poses to public health? However, this indifference might have an explanation. Maybe, this “mysterious” hill hides or used to hide something much more dangerous than ordinary fuel, something much more deadly, something that might have left traces behind, here, in the depths of Montedoro: on this “green” hill on the border with Slovenia there might have been also parts of the former, super secrets supplies of Italian chemical weapons. Before and during the Second World War, Italy had collected a remarkable arsenal of chemical and bacteriologic weapons (and tested them on the battlefield during the war of occupation against Ethiopia, including against the harmless, civil population) and this arsenal was ready for just another battlefield. The most common chemicals were sulfur mustard, phosgene, anthrax, and arsenic. All gasses were used inside artillery bullets of both the army and the navy, but also in the bombs of military aviation. There were at least 1,000 tonnages of unused sulfur mustard, part of it contained in cans. It was discovered that two depots in Piemonte, alone, were used to stock 110,000 artillery bullets of various calibers, all with gas nose cones, ranging from cannon ammunition (75mm) to heavy calibers (305mm) loaded with phosgene (one of these bullets alone might have exterminated thousand of people). As war outbreak in the East, it became necessary moving the chemical arsenal, maybe in view of its possible use during the Balkan war. And it is sure that Trieste, bordering with Yugoslavia, was in a strategic position, also, it was provided with a big port and petrochemical plants, both suitable to transport and store chemical weapons ready for the battlefields. However, the depots needed to be stocked safely, especially rom air raids: the depots had to be concealed, possibly right into refineries or – even better – buried in wide, open areas. A refinery perfectly fit for this was the Aquila, opened in 1937 at the entrance of the industrial sector of the port of Trieste, in the bay of Muggia, and very visible from the hills of Montedoro. In 1941 the works to build this hidden citadel under the hill of Montedoro begun, and a pipeline connected it to the refinery. The Allies could not be unaware of the existence of this fortified labyrinth, yet, they only bombed refinery Aquila, over and over. The strongest and most devastating air raid took place on June 10th, 1944, causing the interruption of all refinery activities until the end of the war. But the Montedoro bunkers remained intact. Might it be that the Allies did not bomb the hills because they knew what they were used for? Even if part of the weapons of doom used to stock the Italian chemical were actually hidden within the hills, it it yet to discover where that end up. After September 8th, 1943, Trieste was annexed to Germany, and that Country might have moved the Italian chemical arsenal before the end of the war, maybe to prevent Yugoslav partisans from finding it. But how didi they make it disappear? Either throwing all ammunition in the sea or hiding in on the Karst plateau, behind the city, deep in caves. Even the Allies, after driving way the Germans and taking control of the Province of Trieste – which, after the establishment of the in the Free Territory of Trieste, became part of the new State – might have had interest in getting rid of the inconvenient Italian arsenal which, no matter what, was to be never given to Italy again. It is important underlining that one of the systems used at the time to “get rid” of remnants of war was to simply bury them in landfills by the sea, and this is what the AMG-FTT itself did. For example, it is what happened when the seashore of Barcola (pine lane), currently the main seaside resort of the city, was first embanked. So, this problem is not only about the Montedoro hills. Since 1954, when Italy returned to this contended land, a wide operation for the disposal of waste begun in all of what then was “Zone A” of the Free Territory (read article “Operation dumping sites“). Dumping sites were made everywhere, from the sea, extending the existing landfills and making new ones, to the highlands of the Karst, where dolinas and caves were used for the same purpose, with no shame. The two biggest landfills were made in the final portion of the valleys of streams Rosandra and Ospo, which are divided by the very hills of Montedoro. Even submarine dumping sites were made, deep in the Gulf of Trieste. And this is how a Territory that, under the 1947 Peace Treaty was declared “demilitarised and neutral” became Italy’s dumping site of State. Currently, the most hazardous areas when it comes to chemical weapons are the Noghere Valley (were remnants of war have already been found), the area of the former dumping site of Trebiciano on the highlands of the Karst of Trieste, several caves in the same area (many of which hidden by blowing the entrances), some coastal dumping sites (embankment of Barcola – navigable canal of Zaule – the Ironworks of Servola) and certainly the seabeds of the Gulf of Trieste. Solving this solution is not simple, not only because of the very serious damages it has caused to both the environment and the health of the population of this transnational zone, but also due to the devastation that Italy has caused to the international rule of law by reducing the International Free Port of Trieste and its Territory to a “free” landfill of State, destroying its economy and trades. All of this in perfect and unpunished breach of the Treaty of Peace of Paris of 1947. (Photography: drums for chemicals, in a landfill located on the Karst Plateau aboveTrieste).